Summary: From the author of the beloved Josephine B. Trilogy, comes a spellbinding novel inspired by the true story of a young woman who rises from poverty to become confidante to the most powerful, provocative and dangerous woman in the 17th century French court: the mistress of the charismatic Sun King. Admittedly, I am not the biggest fan of historical fiction anymore. A few years ago, I'd probably say it was one of my favorite genres, that is no longer the case. I think I burned out on all those stories of kings and queens as well as their deceptions at court. However every once in awhile, I find that I'm in the mood for a good historical drama. 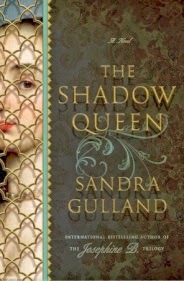 THE SHADOW QUEEN by Sandra Gulland definitely hit the spot! THE SHADOW QUEEN tells the story of Claudette, the daughter of two French actors who works her way up from poverty to become the personal assistant to one of Louis XIV's mistress. Claudette's story has humble beginnings as her family travels across the French countryside as part of an acting troupe. However by a strange twist of fate, Claudette gets involved with Athenais de Montespan and eventually ends up following her to court and becoming very involved in her life. Claudette's new position forces her into some difficult situations as she is becomes a confidant to Athenais. She finds herself part of Athenais' twisted life as she spies for her and even becomes involved in some of her efforts to use Black Magic to increase her own power. When Athenais fears that she is losing her control over the king, Claudette becomes caught up in some very serious actions that put everything she's known and loved at risk! I adored THE SHADOW QUEEN and I have to say that it definitely exceeded my expectations. While stories about kings and queens aren't exactly on the top of my list, I loved this one. It had all of the elements that I look for in historical fiction from intriguing characters, to lots of drama, to romance, and even to deception. Plus it had some historical information that I found extremely interesting. One of my absolute favorite things about THE SHADOW QUEEN was how there was so much information about the early years of French theatre. Ms. Gulland managed to incorporate many of the players in the theatre scene into the story, and I found all of this to be fascinating. I knew pretty much next to nothing about the history of theatre and actors in France, and the drama between the different groups was almost as full of deception as anything that happened at court. In fact, I actually liked how I was able to compare and contrast the two worlds in this novel. Another good thing about this novel was the character development. I thought Claudette was a great character and I actually enjoyed seeing court life through a servant's eyes. In addition, I loved how she went back and forth between life at the court and life in the theatre. As far as Athenais goes, all I can say is "wow -- what a character!" I wasn't all that familiar with her story, but after further looking into her character, I discovered that Ms. Gulland took a very unique approach to portraying her. I especially loved how the author included the Black Magic angle into the story! THE SHADOW QUEEN would make an interesting selection for book clubs. There is a reading guide available on the author's website that has eleven thought-provoking questions. Some of the things you might want to discuss include French society, the church at that time, rules -- both formal and informal, betrayal, trust, family, devotion, friendship, black magic, and love. Overall, I enjoyed THE SHADOW QUEEN quite a bit. Highly recommended to fans of historical fiction. Thanks to Saima Agency and the publisher for providing a review copy of this novel. Well, you know me and the "king and queen" books - I'm not a fan. My mom really enjoys them, though, so I'll tell her about this book. I have this on my stack to read. I like to throw historical fiction into my reading list every once in a while.